Russian tank designers good knew theirs job, they concentrated on the main things: powerful gun, armor, and cross-country ability. During the war, theirs suspension system was much better than in any German tanks or other west countries tanks. F.W. von Mellenthin , German tank general. Victor A. Aminev (BA-10, 8th armoured brigade) destroyed 4 Japanese tanks on 4th Jule 1939. Till 7th July he destroyed 2 tanks more, and also 2 guns and 2 armoured cars. 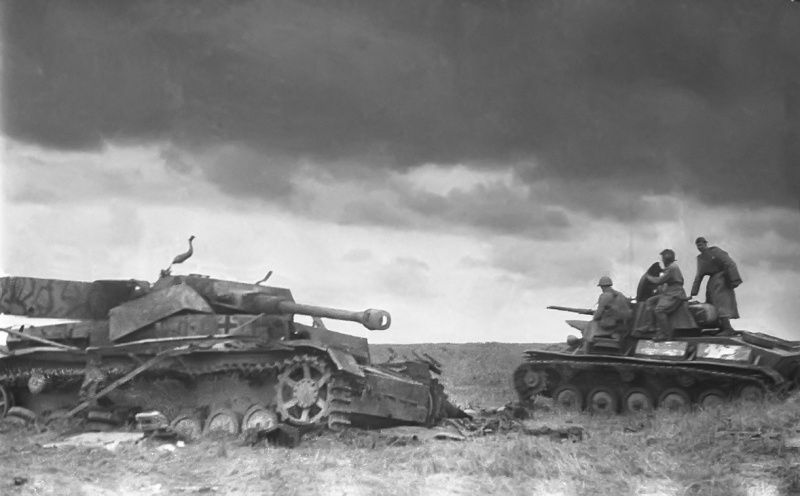 2nd Polish tank battalion (7TP) clashed with the Germans on 5th September 1939. The Poles killed 15 German tanks, and German AT guns killed 13 Polish tanks. On of 7TP (name of commander is unknown) destroyed 5 Pz.Kpfw.I. Sgt. 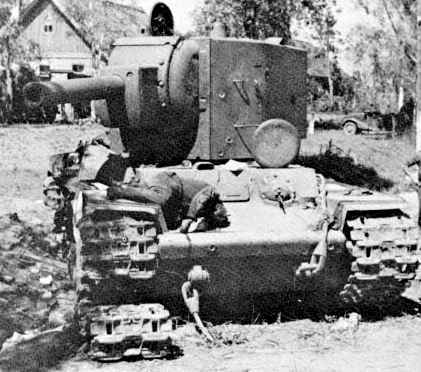 Roman Edmund Orlik in his TKS armed with 20-mm cannon (71th tank batalion) destroyed 13 German panzers [ mostly Pz.Kpfw.35(t) ] during 3 combats on 14, 18 и 19 September 1939. On 15th May 1940, one French B-1bis heavy tank of 1/28 BCC (under command of Sous-lieutenant Louis Latapie) killed 7 German tanks. On 16th May 1940, the B-1bis heavy tank of 41BCC 3DCR (under command of capt. Pierre Billotte) killed many German infantry, two PAK guns and 13 tanks (two Pz.Kpfw.IV and eleven Pz.Kpfw.III) in Stonne town. The incomplete list of Soviet tank aces - over 200 names of the heroes scored with 5 to 52 kills. 2nd lt. Mateus Lah in his T-34-76 (1 brygada pancerna, Wojsko Polskie) destroyed 12 German panzers. Porucik Jasiok Rudolf (1 ceskoslovenska samostatna tankova brigada; T-34 ?) killed 4 panzers, 1 assault gun and 3 ATGs. One American ace is known: staff sergeant Lafayette G. Pool of 3rd tank division. His unofficial score is 258 vehicles, the most of them are halftracks and lorries, and 12 tanks and SPGs, also many different emplaces of guns - allegedly only in 80 days. Sydney Valpy Radley-Walters, gunner of 27th Canadian Armoured Regiment (Sherbrooke Fusiliers Regiment) in his Sherman Firefly killed 18 German panzers and StuGs in 1944-45. Sgt Henry, commander of Sherman Firefly of 1st Canadian hussar tank regiment destroyed 5 Panthers on 9th June 1944. The monster at the road. On 23-24 June 1941 a single KV-2 of 2nd tank division conducted an armored road block in southern Lithuania (near Rassaynjay town), holding up the German advance. The Germans found themself in a trouble when they lost whole supply truck column. Numerious attacks including a battery of 50mm anti-tank guns (which were destroyed at 500m distance), Flak 88 (the Soviets allowed to mount this gun at 700m distance and then killed it) and an engineer unit attack all failed to silence the Russian tank. Artillery fire of 105mm howitzers achieved a hit to the track and the KV was partially immobilised. This heavy tank at the only road and surrounding swamps made German troops supply (with the ammo, fuel and food) and wounded soldiers evacuation impossible. The Germans were forced to use such trick: 50(!) tanks immitated an attack, so it became possible to set another 88mm flak, which managed to eliminate the tank after two days it held up the advance of the entire 6th Panzer Division. The Stukas were not used because a commander not allowed an operation "against one tank". On 18 August 1941, the alone uparmored KV-1 (the number 864, the commander was lt.Kolobanov) was dug in and camouflaged near Krasnogvardeysk town (Leningrad area). The tank had an order to defend the road from Kinigsep. Four more KVs were ordered to defense two other roads. All tanks got double AP ammoloads, 2/3 of rounds were armor piercing. An offensive of 8th German panzer division was expected. Kolobanaov's KV had great hidden position in the woods on the hill, the crossroad located down there between swamps. In the next day German motorcycle recon troops, the halftrack and one light track passed by road. Five minutes later the expected big tank column appeared and filled the road. 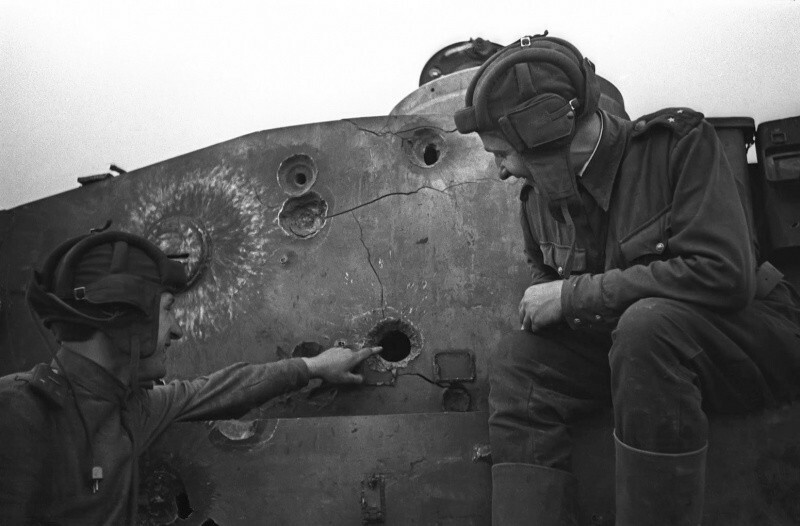 The 1st Soviet round flamed the head tank, after two more shots the 2nd tank was flamed too. 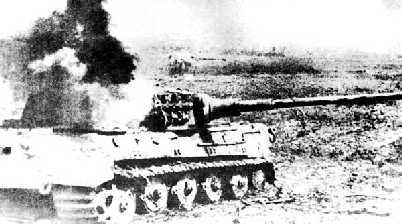 Then Kolobanov opened fire on column's tail and flamed the last tank: the Germans were locked. They even couldn't note Soviet tank and opened no-target-fire. Tried to run, some tanks were immobilized in the swamp. The chaos established on the road. Soviet tankers killed 22 German tanks during 30 minutes. Then the KV was spotted by the Germans and they opened aimed fire. 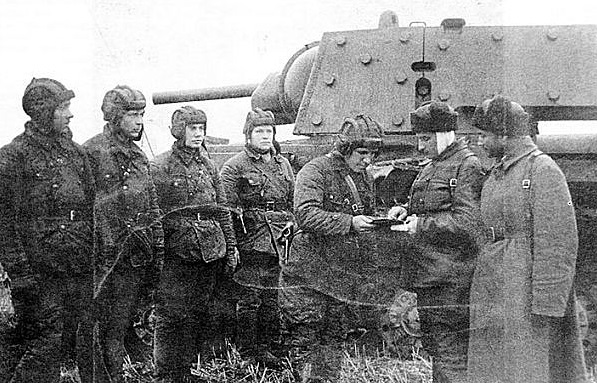 In spite of impossibility of German tank guns to penetrate thick KV's armor, knocking rounds made terrible working conditions for Soviet crew. One of German rounds struck the turret ring and the KV was forced to leave its trench and maneuver by whole hull for aim a target. Then the Soviets noted two German towed guns appeared on the crossroad. The first shell disabled one gun, but another gun managed to do one shot and damaged KV's periscope (the loader Kiselkov replaced it nevetheless the enemy fire). Than that gun was destroyed too. Also the ammo was almost out (12 left), and Kolobanov got congratulations via the radio and an order to go back. Already three another KVs were on the way to the battlefield. There were destroyed 43 German tanks, 19 guns, 11 halftracks. Kolobanov's tank got 135 hits, but no one penetration. Kolobanov was awarded with the Order of Lenin, Usov (gunner) with the Order of the Red Banner. 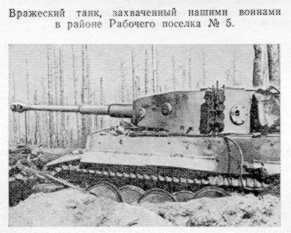 On 23 August 1942, first four PzKpfwVIH tanks arrived to sPzAbt502 unit (Mga station near Leningrad) . 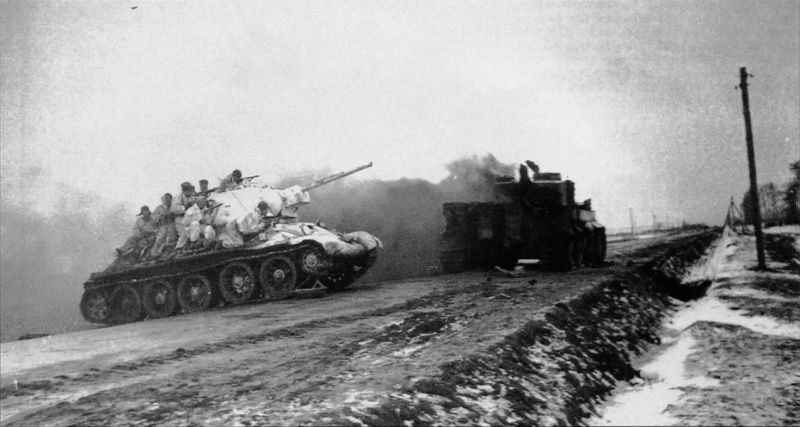 These tanks had a harmless long-range fire contact with Soviet troops near Sinjavino village. Then the tanks tried to attack, but three of them were immobilized because of mechanical breakdowns. The Germans managed to evacuate the Tigers during nighttime, but these tanks were repaired only at September 15. Early morning of September 22, four Tigers and one PzKpfwIII started an attack to Gaytolovo village. They were faced by arty fire and the PzKpfwIII was flamed almost immediately. Then the command tank was hit, (the engine was quit) and its crew left it. After that two more Tigers were killed, and last one stopped in a swamp. So all of five tanks were destroyed. At this time, an evacuation couldn't be performed. Two days after, the Germans brought out all of the instruments and armament, and then exploded the tanks. 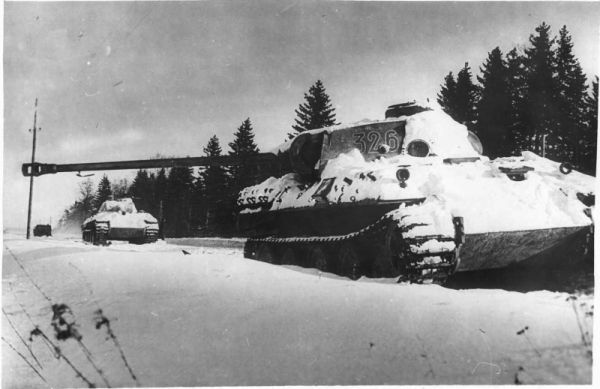 The Soviets managed to capture a Tiger on 17 January 1943, when they tried to deblockade Leningrad. 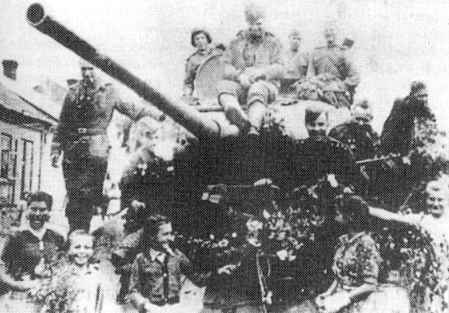 In August 1944, alone Soviet T-34/85 supported by SMG platoon, held defence near Ogledow village, Poland. Meanwhile, sPzAbt501 unit just got 45 brand new heavy tanks PzKpfwVIB. During a 50km march 37 (!) of them were immobilized due mechanical breakdowns. 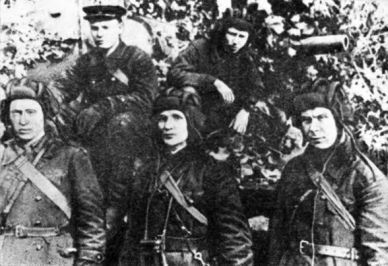 On 10 August, the rest of the KingTigers reached Ogledow. Next morning three KingTigers started attack to a bridge over Vislula river. Gds.lt. Oskin (the commander of the Soviet tank) spotted unfamous-looking German tanks on a road. The T-34/85 was excellently camouflaged, so Oskin decided to wait a little. 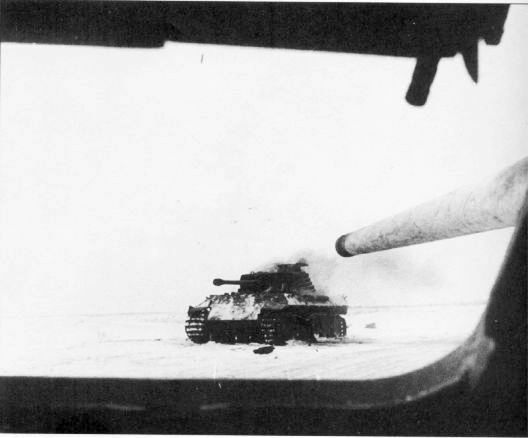 When the Germans reached a distance less than 200m, the Soviets opened fire by APDS and regular AP rounds hoping to penetrate the side armor. One of the KingTigers was flamed by tree hits, and the Germans couldn't even spot where the fire came from. Another PzKpfwVIB took three hits, but its thick armor was not penetrated. 4th round impacted precisely under the turret, and the victim exploded. The last KingTiger tried to run, but it was impossible. The T-34 fired a smoke ammo, then did maneuver to intercept and killed him. The result: 11 men of German crews were killed, 1 captured by Soviet SMG platoon; two KingTigers were totally destroyed, and last one was repaired and moved to Soviet polygon Kubinka (where it was learned). Germans reported about "strong Russian anti-tank defense, impossible to penetrate it by existing forces". Lately, 3 more PzKpfwVIB were captured in Ogledow. Guards lt. Oskin was awarded with the Gold Star of the Hero of Soviet Union, the other crew members (incl. the excellent gunner serg. Abubakir Merkhaydarov and the loader A. Khalyshev) were awarded with an orders. At 26th March 1944 sgt. A. Pegov (the commander of the light tank T-70) of 3rd Guards tank army saw a column of approximately 18 German tanks. Pegov took an ambush and waited untill the enemy get closer to 150-200m. Then he open fire by the APDS ammo and flamed one of the Panther and immobilized another one. The road was blocked, and the T-70 retreated. On 6th July 1943, T-70 of lt. B.V.Pavlovich of 49th Guards tank brigade, destroyed 4 German panzers (3 medium tanks and 1 Panther) near Pokrovka village. Thanks for help to Alexander Abramov, John Fluker and Diego Zampini.